Priorities: A simple tool for getting things done! As the story goes, Ivy Steel was a Business Coach/Consultant to many of the largest corporations. One of his clients was Charles Schwab, the President of Bethlehem Steel (predecessor of US Steel). One day, Mr. Schwab was lamenting to Ivy about how difficult it was in getting his executives to focus and get the most important tasks done. They were constantly being pulled in different directions and in these distractions, many important tasks were not accomplished. After hearing Charles comments, he said “Mr. Schwab I have a solution for you”, to which Mr. Schwab said “how much is this solution going to cost me?”. Ivy said “nothing up front, I will coach your executives on a tool for being more efficient and getting things done. If at the end of six months you have not seen a significant increase in effectiveness, then you owe me nothing. However, if you have seen an increase in effectiveness, then pay me what you feel the advice was worth.” Mr. Schwab had nothing to lose so he agreed. The first thing he did was to get Mr. Schwab’s agreement for he and his executives to follow the recommendations for the six months to the tee. Secondly, he required Mr. Schwab to introduce him to all the executives in a meeting and then leave the room. 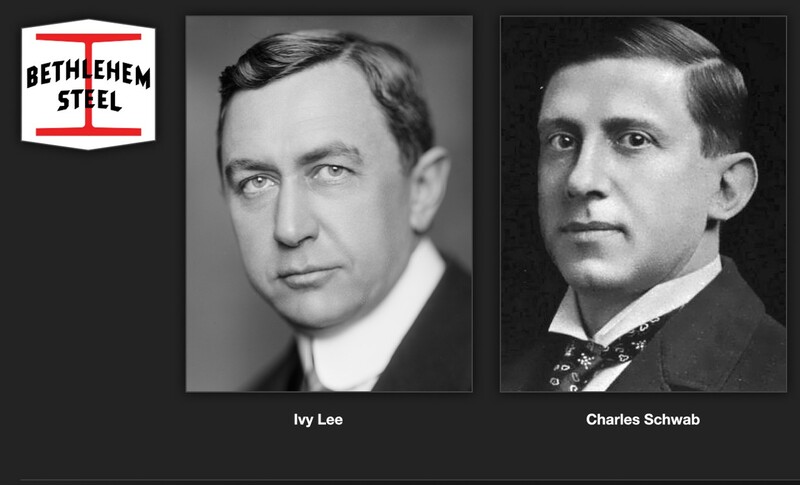 Ivy told the executives that Mr. Schwab had hired him to increase the effectiveness and that the executives were to follow his orders to the tee and that any executive who did not would be dismissed. Thirdly: Ivy instructed the executives to determine the most important short, medium and long term goals of their department that was in line with the growth goals of the company. Lastly: Ivy instructed the executives at the end of each day for the next six months they are to write down on a notepad the five most important things for them to do the next day. These action items had to be in line with their division goals and the company’s goals. Then place the notepad in the middle of the desk for Mr. Schwab to see before he left for the day. At the start of the next day they were to instruct their assistant that there were no disruptions for the first three hours of the day. They were to work on the number one goal until they could take it no farther, then start working on the second goal and thereon. At the end of six months, Ivy returned and in his conversation with Mr. Schwab, the exercise was extremely successful and Mr. Schwab authorized a check to Ivy in the amount of $35,000 (1910 dollars), probably a $1 Million dollars today. I use this simple tool, I have implemented it at most of my coaching clients, so I know it will work for you and your team.